The big challenge when you shoot images with an iPhone is to successfully capture great-looking photos from a gadget that’s primarily designed for chatting. If you keep these tips in mind as you shoot, however, you can take some pretty sharp pictures. It’s a good idea to get in the habit of accessing the camera from the lock screen on your iPhone. Press the Home button to wake up the screen, and slide the camera icon to the top of your display. This way, you can take a shot without having to enter your passcode or using Touch ID. Keep the Camera app at the ready by putting it in the Dock at the bottom of the screen, or by swiping up to access the Camera shortcut in Control Center. Another way to ensure that you’re always ready to take a shot is to stick the Camera app on your first home screen, or even in the Dock at the bottom of the screen. In iOS 7, you can also quickly access the camera in the Control Center. Just swipe up from the bottom of the screen to see your Control Center. The Camera app is in the bottom right corner. Capturing a good photo isn’t just a matter of knowing the right settings. Compose your photos as the pros do. 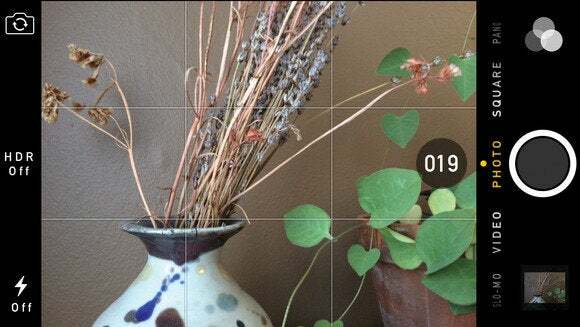 Use the iPhone’s Grid feature to divide the frame into horizontal thirds, and put your subject on one of those lines, rather than in the middle of the screen. Be careful to keep the camera level, too; nothing ruins a photo like a tilted horizon. Also, keep an eye on the background to make sure that you don’t see anything “growing” out of the top of someone’s head. One reason you may tend to get blurry photos with your iPhone is that it’s light and thin, and hence rather awkward to hold compared to a full-size camera. Hold the phone as still as you can, using both hands, and keep your elbows tucked into your sides for support. Take a deep breath and let out a slow, steady exhale as you gently tap the shutter release button. You can also use the Volume Up button on your phone or headphone cord to trigger the shutter rather than relying on the on-screen shutter button, to keep from jostling your iPhone too much. Since your iPhone’s shutter controls are digital, you’ll run into software-based shutter lag—the time between when you take the picture and the when the sensor actually records the picture. Also note that the on-screen shutter button trips after you lift your finger, not when you press it. When you take a shot using the touchscreen’s shutter button, tap it lightly to avoid shaking the camera and blurring the image. To compensate for this lag, hold the camera steady and count how long your shutter takes. And if you use the touch- screen button, tap it lightly to avoid blurring your photo. If you are taking an action shot with an iPhone 5s, try holding down the shutter button to use that model’s Burst mode. When you do this, the camera takes up to ten photos a second. When you’re done, the iPhone will pick the shot it thinks is best, though you can manually review all of the photos in the series. Your phone can handle a lot of situations with aplomb, but it can’t shoot every scene you encounter. Your teeny image sensor craves light and does best outdoors in daylight. For the best exposures, keep in mind the advice that photographers have followed for many decades: Try to position yourself so that the sun is behind you or over one of your shoulders. Avoid shooting directly into the sun, or you’ll radically underexpose your subject. If you’re shooting indoors, position your back to the window and turn on the lights. It may sound counterintuitive, but when you’re shooting in daylight, a fill flash is your secret weapon. It produces a quick burst of light to reduce the shadows that bright sunlight can causes. A fill flash provides pleasant, even lighting on your subject’s face to fill most of the shadows. Of course, the tiny LED flash works only at very close range, so don’t expect it to help unless you’re within a few feet of your subject. Ever since the iPhone 4, you’ve been able to use an HDR mode that melds several exposures to create a single picture with an impressive amount of detail and a broad range of tones and colors. Try using it instead of the flash when you’re faced with tricky lighting conditions. 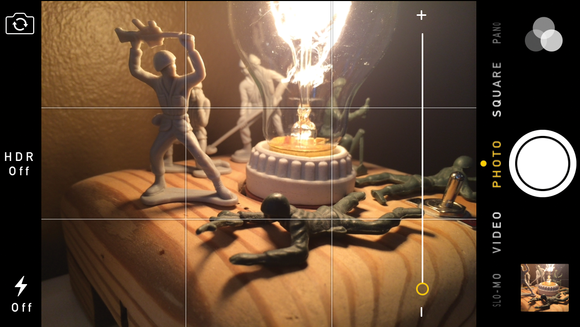 Your iPhone can’t magnify the image by using an optical zoom, the way many compact or professional cameras can. Instead, it uses a digital zoom, which merely makes the pixels big and blocky, obliterating fine detail. Zooming in digitally also makes it even harder to take a steady photo. Whenever possible, eschew digital zoom in favor of actually getting closer to your subject. Want to fill the frame? Then move closer to your subject. If you really need to zoom in, you can get the same digital effect with an image editor later. Pick up some third-party photography software to enhance your images further. 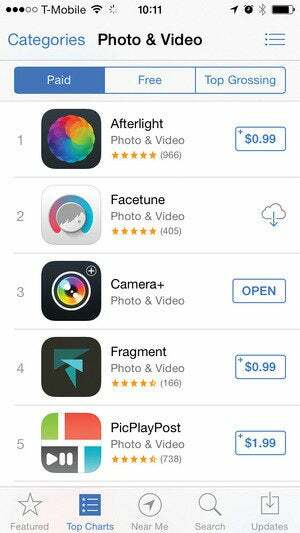 One of the biggest benefits of carrying an iPhone is that you can install scores of apps. Check out the iTunes App Store to find programs that improve the way the camera works, as well image-editing apps that let you enhance your photos after the fact. After you snap your photo, you can use the Photos app, iPhoto, and third-party apps to make tweaks. You can wield most of these controls as if you were adding spices to a soup: Experiment and apply them “to taste.” The saturation controls, for example, adjust the intensity of colors. It’s usually best to stick with low or medium levels, since high levels tend to make everyone look like an overcooked turkey. Effects such as negative, sepia, and black-and-white can also help you take charming photos. Lauren Crabbe is a former Macworld intern and current freelance technology writer specializing in photography applications for iOS and Mac.